Berkeley is a sailing mecca! If you want to get involved in sailing, join Cal Sailing now! 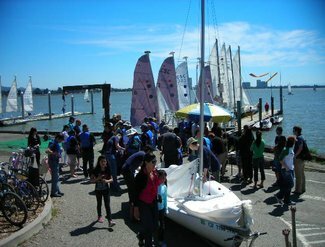 The Cal Sailing Club is a non-profit, volunteer-run sailing club located in Berkeley on beautiful San Francisco Bay. Membership costs just $75 for 3 months ($70 for students and seniors) plus 2 hours volunteer work and there are no charges for lessons, equipment use, cruises, or other club activities. Cal Sailing has an amazing fleet of high performance dinghies and six keelboats! OCSC Sailing is a premier San Francisco Bay sailing school and sailing club. They offer sailing lessons, sailboat instruction, US Sailing Certification, sailboat charters, club membership, corporate teambuilding events, and bareboat vacations. From beginner sailboat lessons, to offshore training, to spinnaker sailing, to world cruising preparation, they are committed to teaching you how to sail with confidence. They have an amazing fleet of keelboats that includes 21 high performance J/24s. They also have a dozen or so 30+ foot yachts!